Home Sea Sea South Africa boosts naval capabilities but can it afford an expansion? South Africa boosts naval capabilities but can it afford an expansion? In February 2017, South Africa announced the preferred bidders for two of the largest naval programmes in Africa, with the South African Navy set to receive a major boost to its surface fleet and its maritime patrol and surveillance capabilities. 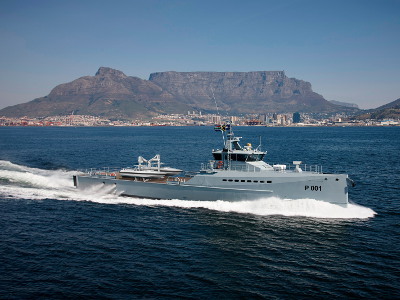 Southern African Shipyards (SAS) was selected for the construction of a hydrographic survey vessel under Project Hotel and Damen Shipyards Cape Town chosen for the construction of three Offshore Patrol Vessels (OPVs) and three Inshore Patrol Vessels (IPVs) under Project Biro. Of all the arms of the Apartheid-era SA armed forces, the South African Navy (SAN) suffered the most neglect and decline. The SAN had tried to retain a veneer of “blue-water” capability with no fewer than three ex-Royal Navy frigates being acquired between 1950 and 1952, and a further three frigates being purpose-built in the 1960s. Only the latter three vessels possessed any tangible combat capability. But one – the President Kruger – sank in 1982 in a collision. The other two – President Pretorius and President Steyn – became unserviceable by the 1980s. While the Steynwas later cannibalized to provide spares, the Pretorius was decommissioned in 1990 after a prolonged period of inoperability. Attempts to acquire two French corvettes were stymied by the arms embargo imposed upon the Apartheid regime in 1978. The embargo also halted efforts by the SAN to replace three ageing Daphne-class submarines with vessels of the Agosta-class. The Apartheid-era SAN was reduced to being a navy of missile boats, bolstered by the three Daphne-class submarines. Nine vessels – built to a modification of the Israeli Reshef/ Sa’ar 4 design (and known in the Apartheid-era as the Minister-class) – were inducted into the SAN between 1977 and 1986 (three being built in Israel and the remaining six in South Africa). Despite being an efficient and effective combat force, the impact of the arms embargo combined with the high cost of maintaining large surface assets led to the decommissioning of 15 vessels in 1985 alone, effectively reducing the force to a “brown-water” navy. During the period 1966 to 1989, the SAN saw extensive service against the South-West African People’s Organization’s (SWAPO) insurgents as well as against Cuban and Popular Movement for the Liberation of Angola (MPLA) forces in Angola. For these 23 years, the SAN had effective naval dominance of the seas around Southern Africa. Even the potent force of four Shershen torpedo-boats and six Osa-II missile-boats operated by the Angolan Navy was unable to contest the seas against the well-trained and highly-motivated SAN. The SAN conducted multiple raids in support of SA special-forces teams and carried out extensive electronic surveillance and support activities in support of the SA army during its counter-insurgency operations in erstwhile South-West Africa (now Namibia) and its conventional operations against Angola. In 1999, in a decision that would prove to be highly controversial, the post-Apartheid government of President Nelson Mandela entered into a series of contracts aimed at restoring the SAN’s “blue-water” capability through the purchase of four modern frigates and three new submarines. Between 2001 and 2007, four Valour-class light frigates/corvettes of the MEKO A-200SAN design were inducted into service. Built in Germany at a cost (at 2007 values) of R9.65 billion, these vessels – capable of carrying helicopters and armed with surface-to-air and anti-ship missiles – represented a quantum leap in capability for the SAN. These vessels are easily the most powerful surface combatants in sub-Saharan Africa and restored South African naval pre-eminence for the foreseeable future. It is of interest that the vessels, despite their formidable armament and undeniable capability, lack any anti-submarine detection equipment or weapons. This is, perhaps, in recognition of the fact that no navy in sub-Saharan Africa operates or is ever likely to operate submarines outside of SA itself. The SAN also acquired three Heroine-class submarines of the Type-209 1400-ModSAN family between 2004 and 2008. These vessels, sub-types of which are in service with Argentina, India and the Republic of Korea, replaced the Daphne-class submarines of 1960s vintage. The SAN considered the Type-209s as its first “true submarines” since their underwater performance and endurance was considerably superior to the Daphnes. It is noteworthy that both the frigates and the submarines were acquired from Germany rather than from France or Israel or the United Kingdom which had hitherto been the major suppliers of equipment to the SAN. However, these two acquisitions (along with acquisitions for the RSA Air Force) came under intense scrutiny after allegations of extensive bribery and other corrupt practices were made against South African government officials at nearly all stages of the procurement process – from the selection of the items to be purchased to the negotiation of the financing packages. Andrew Feinstein, who resigned as an MP of the ruling African National Congress (ANC) when the government moved to curtail a probe into the deal, believed that the corrupt practices in these arms purchases were when the ANC lost its “moral compass”. To date, while much debate has been generated and even more circumstantial evidence unearthed, the probe has produced no definitive results but the rumours of corruption around these procurements refuse to go away. Had these procurements resulted in a sustainable restoration of the SAN’s capability, it is possible that the controversies might have not continued to resurface. However, both the Valour and Heroine-classes have experienced severe operational problems, which have called into question their suitability for a navy which is suffering (like the rest of the SA armed forces) from chronic problems of retaining trained manpower. Indeed, it is questionable as to whether SA will ever be able to maintain sufficient trained crews to operate such sophisticated vessels especially when there is active “poaching of such personnel by the civilian-shipping sector.” The manpower problem is such that analysts have described the SAN as being “crippled” by manpower shortages – exacerbated by the fact that even personnel recruited are often unqualified. In addition, there have been constant reports of accidents and maintenance deficiencies severely reducing the operational availability of both the submarines and the frigates. While it is an exaggeration to suggest that the vessels are “inoperable”, there is little doubt that ship availability is a major challenge. The submarines, in particular, have had chronic serviceability problems, which led to all three vessels being dry-docked in 2012 following a major submerged mishap suffered by the sole operational vessel. The frigates have also experienced serviceability problems caused in part by design shortcomings in the underwater exhaust valves which caused an ingress of water when the vessels rolled excessively. It is surprising that such a defect was not discovered either during the design phase or during sea trials. Compounding these technical and manpower constraints is the paucity of funding for operations. In 2016, the SAN found its budget reduced by R147 million, which made sustaining more than one or two frigates and submarines at the operational level very problematic with attendant problems of developing and maintaining proficiency among personnel. The SAN seems to be under no illusions about any increase in its operational budget in the foreseeable future. This, however, makes the SAN’s desire to increase its surface fleet with the addition of seven more vessels all the more puzzling. With only four principal surface combatants, the SAN would clearly be acutely short of ships for patrol duties. To meet the demand for patrol assets, the SAN took the logical step of converting its three surviving Reshef/ Sa’ar 4- class vessels (known since 1994 as the Warrior-class), into OPVs/ IPVs. For this task, the vessels had their missiles and one of their 76mm guns removed – reflecting the switch to a constabulary role. The vessels completed sea-trials in 2013 and are extensively used in the patrol role. The ageing SAS Protea is currently the SAN’s sole hydrographic survey vessel and as such the urgency of Project Hotel is understandable. Project Biro calls for the construction of three OPVs and three IPVs – presuming the latter will replace the modified missile craft. Given the fact that the preferred bidder is Damen Shipyards Cape Town (affiliated to the Damen Shipyards Limited of the Netherlands), the specifications for the intended OPVs and IPVs suggest that the former will be based on the Damen 1800 Sea-Axe design of 85 metres length while the latter will be based on the FCS 5009 or SPa design which measures 50 metres in length. However, this second project is not entirely comprehensible. While the rationale for the OPVs is understandable, the requirement for such large IPVs is somewhat puzzling. The IPVs would be too small for meaningful off-shore work while being too large to be economical for inshore work which is best performed by smaller craft. One defence analyst – Helmoed Romer Heitman – has suggested that the SAN would be better served by increasing the number of OPVs and cancelling the IPV order. Even if the rationale for the vessel choices were to be accepted, it has to be asked whether the RSA has the budget to not only fund the construction of the ships but also to ensure their sustainable operations. Here, it is worth nothing that as late as October 2016, budgetary constraints led to both Projects Biro and Hotel being put on hold. It was reported that the bids submitted exceeded the earmarked funding for the projects, leading to serious questions about the sustainability of such a large purchase – much less an increase in the number of OPVs. In addition, given the chronic manpower shortages being experienced by the SAN, the crewing requirements for seven new vessels must be a factor that raises questions over the timing and sustainability of these purchases. If the RSA wishes to proceed with Project Biro, it may need to consider whether it is possible to continue operating the four frigates and three submarines that form the nucleus of the fleet. It is suggested that the SAN may wish to consider a system of rotational storage of the vessels which keeps a proportion of vessels operational and the remainder in storage on a rotational basis. A similar system already exists in the South African Air Force where at any given time at least half of that service’s Gripen fighters are in rotational storage. Nonetheless, Projects Hotel and Biro will bring about one undeniable benefit – a boost to the South African shipbuilding industry. By partnering with the well-established Damen shipyards of the Netherlands, South Africa hopes to expand its ship building industry into a viable commercial undertaking. The projects will infuse new technology into a somewhat moribund sector of South African industry and will enhance local skills and supply chain development. The SAN in the post-Apartheid era has been completely transformed from a “brown-water” force of missile craft and short-range submarines to one with considerable “blue-water” capability. However, serious allegations of corruption have marred its procurement processes. In addition, budgetary shortfalls and personnel problems have contributed to reducing the availability of surface and sub-surface assets. Despite these problems, the SAN has ambitious expansion plans for its patrol assets with an emphasis on developing local shipbuilding capabilities. While the aforementioned projects will add much to the capabilities of the SAN, the inherent budgetary and manpower constraints currently plaguing the service show no signs of abating. In these circumstances, the RSA may be forced to make choices between either significantly increasing the budgetary allocations for the SAN or adopting a rotational storage programme to preserve capability while reducing operational costs. Written by Sanjay Badri-Maharaj, Institute for Defence Studies and Analyses. Originally published by Institute for Defence Studies and Analyses. The original article can be found here.